Your translated documents must be accurate and precise. Your company’s reputation is at stake. You can even ask us to have the content of your translations reviewed by an expert (lawyer, accountant, engineer, etc.). 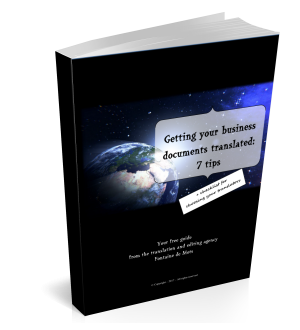 Expand your customer base and grow your sales by having your website and business documents translated! Fontaine de Mots specialises in the four most commonly-used business languages in Belgium: French, Dutch, German and English. Need another language? Contact us to find out more. You will also find advice on our blog on how to grow your business in Belgium and worldwide. the first will translate your text, while the second will carefully check the translation against the original, sentence by sentence, to ensure there are no mistakes. This is a vital step if you care about your reputation (remember your customers will judge the quality of your products/services on the quality of your written communications). We use specialists who are very familiar with your industry’s terminology. On delivery, we give you the translators’ names, which proves not only that we have used professionals but also that we recognise a job well done. We manage your project from A to Z: simply send us your documents. We will select the best translators, manage their availability, liaise between the different specialists, ensure coherence of terminology over time, etc. Discover the benefits of working with us, our mission and testimonials from some of our clients. You can even watch interviews with six of our translators. Read our blog for a host of advice. We add new content regularly.